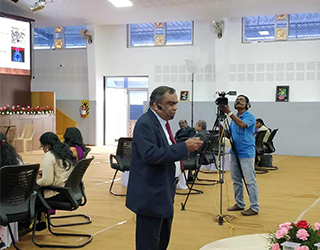 TheTeacher.in, in association with St. Jude’s Public School and Junior College, Kotagri, organised an Educators’ Meet in Kotagiri on 02 February, 2019, for the schools in and around the Nilgiris. 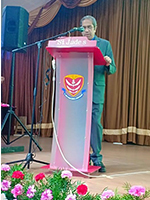 G. Balasubramanian, former CBSE Director was the keynote speaker and Mr. P. S. Sundar, an International Management Consultant and Journalist, was the Guest of Honour. Mr. Sundar addressed the gathering and aptly spoke of how technology is very important in today’s education world but at the same time can never substitute teachers. While addressing the gathering, he also made the word ‘FUTURE’ an acronym, giving a refreshing start to the Meet. G. Balasubramanian spoke of the trends in today’s education scenario, how teachers need to be well-equipped to teach the children of today and also spoke of how ‘teachers should stop teaching and start reaching’, while addressing the Principals and educators of various schools on the topic ‘Future Ready Schools’. He kept the audience engaged, entertained and active throughout the session, with his thought-provoking questions, interesting anecdotes and a few interactive activities. With nearly 20 schools taking part in the Meet in the hills, the principals and teachers who attended it went back with smiles on their faces, thanking the organising school and the keynote speaker for a wonderful session. The Educators Meet Kotagiri edition also witnessed a lot of media personnel covering the event. CLICK HERE to read the coverage from various newspapers.